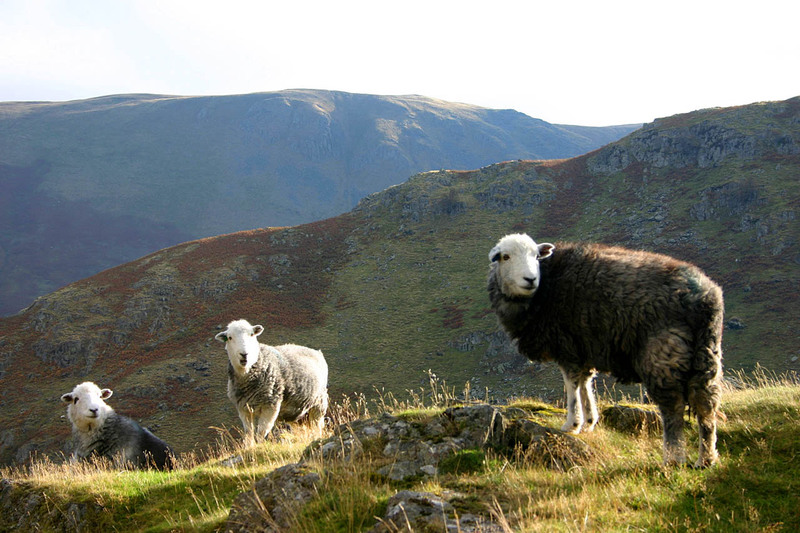 "The word Herdwick is mentioned in documents going back into the 12th century, and means 'sheep pasture'. Flocks were kept by the monks from Furness Abbeyon their farms in upper Eskdale at Brotherilkeld, mainly for their wool. Beatrix Potter had a very keen interest in the breed and, just before her death in 1942, she left a number of her farms to the National Trust with the stipulation that Herdwick sheep must be kept, an obligation which still exists to this day on selected farms. This has resulted in generations of Herdwick sheep being raised on the same fell sides from which there is little movement. The elimination of entire herds due to the foot and mouth disease therefore interrupts this unique phenomenon - merely replacing stock is not as easy as it seems as, if introduced onto fellsides, it will take years to become properly established. 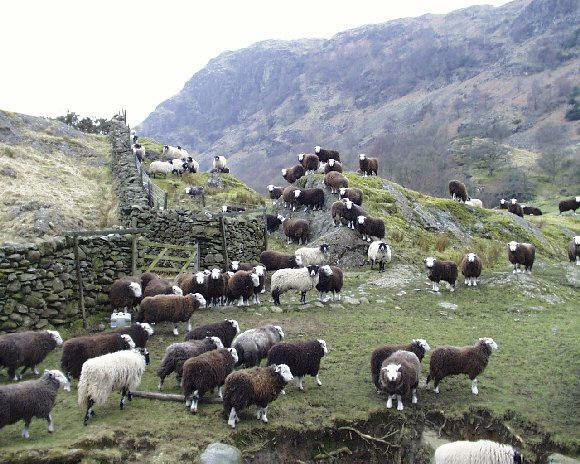 Maintaining Herdwick flocks on the fells is crucial as they assist in producing the landscape we all know, however in economic terms life is difficult for breeders as the rough terrain the sheep frequent often means that not all ewes lamb, and very few produce twins. 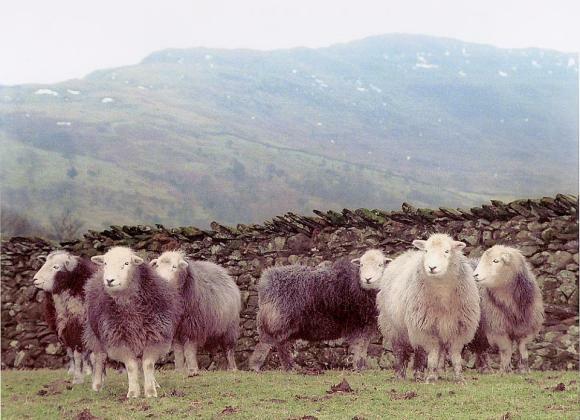 Herdwick wool has the lowest value of any British Wool, the sale of which rarely covers the expense of clipping. 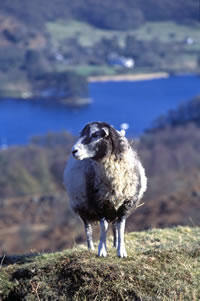 Herdwick meat however is a different story, offering excellent flavour and being recognised as providing high quality. It was the meat eaten at the Coronation Dinner in 1953". For a friendly sheep who climbs over your web page, try this little programme. Download it to your desktop, double click and the sheep appears. The more times you click the more sheep you get! Don't worry, they go away when you close down the computer! Right click on the sheep and try different commands (all in Japanese of course, so it's pot luck) and see if you can find the spaceship (and other things besides!) . . . The Southdown sheep has roamed the Sussex Downlands from time immemorial. Around 200 years ago, John Ellman of Glynde, near Lewes, in Sussex commenced a radical improvement of the breed by selection within the breed - no outcrossing. His work was continued by Jonas Webb of Babraham in Cambridgeshire, who developed a somewhat larger animal which was used in the creation of the other Down breeds. The peak of the Southdown's popularity was from about 1790 to the 1914-18 War. During this time they were to be found on many of the large estates in flocks of 1000 or over, as well as being in the possession of yeoman farmers. Although it had been exported to many parts of the world, probably it had its greatest impact in New Zealand, where it was the sire used in the production of the "Canterbury Lamb", a position it held for many decades. The Southdown of today has returned to a larger more active sheep, partly due to the reintroduction of New Zealand and French blood. Southdowns have been around for centuries, and their lineage is indisputably ancient, reaching back to a time "older than the peerage". In the nineteenth and twentieth centuries they were to be found in quantity especially in and around the area of the South Downs near Lewes in Sussex, and it was from here they gained their name. It has been estimated that there were some 110,000 sheep in Sussex in 1341 and their wool was second only to the Hereford sheep in fineness and quality. In 1813, nearly five centuries later, the Reverend Arthur Young estimated that there were 200,000 ewes kept on the eastern South Downs and commented that "the amazing number they keep is one of the most singular circumstances in the husbandry of England". The principal reason for the large concentrations of Southdown sheep on downland farms over these centuries was their crucial role in the maintenance of soil fertility. The large flocks grazed the open downs by day and at dusk came down to the lower arable land for folding. The downland soils tend to be chalky and not naturally fertile so that the close-folding by the sheep on small areas manured and trod the soil. This meant that bread wheat could be grown successfully the following year. With the gradual introduction of new crops such as field turnips, swedes, kohl rabi and other forage crops the folding system took off as never before, increasing in parallel with expanding human population. The system reached its zenith in the 'Golden Years' lasting from about 1845 to 1870 or 80. Then began the Great Depression. A severe and prolonged fall in the prices of wool and cereals due to rising volumes of imports from the New Countries was accompanied by the Wet Years - a six year period of cold wet weather with little sun. In 1883 the weather relented but the Depression continued. New men and new methods in farming were just beginning to move onto the scene but so sound was the classic downland farming system that even by Queen Victoria's Diamond Jubilee in 1897 the sheep-and-corn system was still intact. The New Century brought with it the establishment of pedigree recording. By 1911 there were 359 registered Southdown flocks containing some 114,495 breeding ewes throughout Britain. About this time it was noticed that dairy cows were rising in numbers. Fresh milk could not then be imported and dairying became increasingly important in farming's economic survival. But much remained the same until the Great War of 1914-1918 when the large number of folding Southdown flocks declined with some rapidity, as shepherds and farm workers went off to war. By 1922 the short-lived War-time farming boom had evaporated and the 359 pedigree flocks had shrunk to 245. The number of dairy herds continued to grow apace but from 1922 to 1939 the registered Southdown flocks hovered around the 200 mark. Folding flocks were no longer economic and smaller flocks averaged only 135 ewes apiece. The use of artificial fertilizers had gained ground and the combine-drill, which sowed grain seeds and fertilizer together, rendered close-folding by sheep unnecessary. Gradually surrendering to basic arable farming changes, the Southdown became largely a grassland breed. During the inter-war years the United Kingdom became known as the stud-farm of the world in all the farm species and pedigree Southdowns were still being exported to most parts of the world, with New Zealand taking the lion's share. In 1937 the number of exported Southdowns reached 459 head. In 1939 World War II again intervened and the Southdown breed was once more hit badly. The South Down hills were commandeered for military training, only fringe farms being left producing milk for the towns, the others misused as target practice and their very nature changed by the demolition of all the traditional farm buildings. 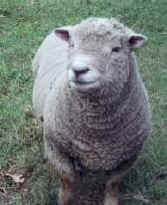 The Southdown sheep is a very hardy breed of domestic sheep, and is valued primarily for its lambs. Southdowns breed once a year and the ewes produce more amounts of high quality lambs than any other breed. Southdowns are often used for crossbreeding with other species in order to produce more meaty lambs. Sheep in general were domesticated by man around 8,000 years ago. The history of the Southdown, however, has only been traced back a few centuries. Few facts are known about this breed prior to this time, except that they were a hardy race and probably indigenous to a restricted area in England, from whence the Southdown got its name. 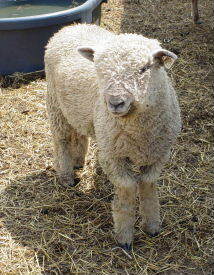 The Southdown acquired its name from the hills, or 'downs', of Sussex, England. These rolling hills cover an area of only sixty miles long and about six miles wide. It is thought that the Southdown sheep we know today originated from the sheep that grazed the downs centuries ago. The introduction of the Southdown to the United States possibly occurred in the 1600s, when the sheep were brought to Jamestown, Virginia in 1609 and to Plymouth, Massachusetts in 1628. By 1676 sheep were plentiful in New England, and were considered 'native' to the area. However, these sheep were known to have descended from importations from 1628 and later. These "native sheep" were called "Irish" or "English Smuts", and were probably descendants from the old English Southdowns. By 1900, Southdowns were well established in the United States. The size and length of the Southdown sheep is much larger today than 300 years ago due to successful attempts at improving the breed. Improvement in the American Southdown breed has been accomplished through mutual cooperation and competition among breeders and will continue to occur. Although much attention has been given to breeding Southdowns, this species is still considered a minor breed of domestic animal, This means that the animal exists in small numbers and is possibly in danger of extinction. 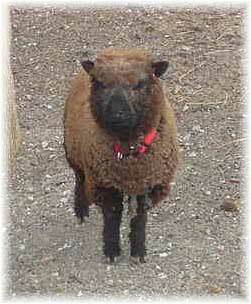 The Southdown, like many other breeds, has possibly replaced its ancestral counterpart. As agricultural practices change to meet the needs of the future, the genetic diversity and valuable qualities of the older breeds become more and more important. The American Minor Breeds Conservancy is an organization dedicated to help save these rare breeds of livestock. The status of the Southdown sheep is listed as WATCH under this organization. WATCH means that there are fewer that 2,500 North American registrations annually and less than 10,000 globally. "One of the oldest of the English Breeds of sheep is the Southdown, originating on the South Down hills of Sussex County, England. These small sheep were know for their extreme hardiness and produced meat with unmatched tenderness and flavor then any other breed of sheep. "In 1780 John Ellman, realized the potential of these animals and set out to standardize the Southdown breed. In England, these small Southdowns grew in popularity up until 1908 when there were approximately 367 registered flocks totalling about 110,000 ewes. The growth in this breeds' development slowed in the early 1900's as World War I brought a sharp decline in their numbers. By the end of the World War II, the demand for larger cuts of meat had almost forced the breed into extinction. "It is believed that the breed reached the United States in 1803. 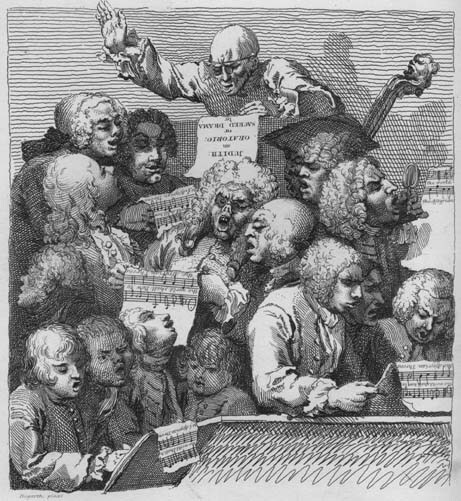 Their popularity grew and later declined in nearly the same pattern that had occurred in England. The small Southdown could not satisfy the consumer demand for larger meat cuts. This was a significant factor in the development and mass production of the larger, leggier Southdown of today. This divergence from the original breed standards was the beginning of what would later become two distinct lines: The Southdown and the miniature (or original) Southdown. In breeding for these larger characteristics however, many of the original "miniature" attributes were bred out and nearly lost. Each year brought a further decline in the number of these "original" Southdowns. "In 1986, Mr. Robert Mock began a search for the sheep with the original blood lines and that conformed to the original Southdowns of the 1700's. However, finding them proved to be difficult. At one point they were believed to be extinct. After a four-year search, two small flocks totalling 26 sheep were located; however, this group would not be able to provide a sustainable gene pool. After an extensive search, a total of 350 of these miniature sheep were located. Many of them still carried their original Southdown registration papers. "To distinguish these small sheep from the larger modern-era Southdown, Mr. Mock named them “Olde English Babydoll Southdowns". To keep this line pure, a registration was formed. Only adults two years and older were accepted so that they could be judged against the original conformation standards as verified by a veterinarian. Each sheep's registration application was passed before a board of three members of the Breed Association. After this initial review and acceptance period, the "Foundation Flock" registry was closed in 1991. The term Foundation Flock is still used to refer to this original pool of sheep. "Subsequently, the process of registering lambs from this original foundation flock began. The registry now celebrates many years of success with the preservation of the “babydolls”. It gives my wife and I great pleasure being part of the preservation of this wonderful little sheep. But most of all, they are a wonderful animal to own… "